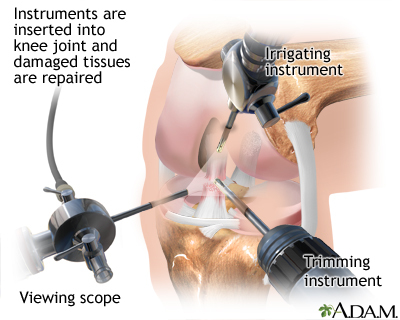 Arthroscopy is a procedure for diagnosing and treating joint problems. During arthroscopy, a surgeon examines and, in many cases, repairs your injured or diseased joint with the help of an optical instrument called an arthroscope. An arthroscope consists of a light source, a lens system, and bundled glass or plastic fibers (fiber optics) to carry light to the area being examined. These instruments are encased in a tube, usually about one-eighth of an inch (4 mm) in diameter. A video camera attached to the arthroscope relays the view from within your joint to a video monitor. Because the arthroscope is so narrow, your surgeon needs only a small incision to place it in your joint.